Now I am slightly nervous that when I describe why I bought these, it is going to sound something similar to when a nurse suggests pantyliners to an 80 year old but please go with it - Marks and Spencer have a new range called Insolia. Insolia is an extra something special in the soles of the shoe, which means that your distribute your weight more efficiently - and therefore don't put all the pressure on the front of your foot. 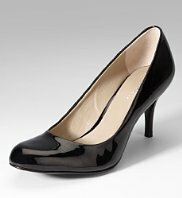 You can honestly feel the difference, and as someone who is sadly often in flats - I can wear these all day without any trouble at all. 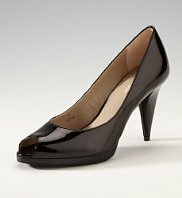 When you look at the website, there are definitely some pairs for the mothers and some pairs for the daughters - but, honestly my classic black stilettos are working wonders for me and I am wearing them to death - I just can't wait for them to arrive in cream! I wear mine in the office, and weekend drinks. I was even walking around in them in my PJs at the weekend just to prove to my boyfriend I could wear heels for 24 hours straight (I needed to convince him of the purchase as only his grandmother apparently buys shoes from M&S). Visit the website here: Marks and Spencer Insolia Range - standard price is £49, but many are reduced to £20. Trust me on this, buy them - they're amazing! So cute! And they'll go with anything. Great pick.